If you’re thinking of upgrading your bike, you’d do well to take note of some of our suggestions as we’ve got a list of the best bike hacks around right now. The first one that we’d recommend is the Hammerhead which we’re showing in our lead image. The Hammerhead device is a small but powerful sat nav device that pairs with your smartphone to give you the guidance you need on a really long ride. The directions your phone’s given are translated into a simple set of lights that blink when it’s time to turn. Mounting the device on your handlebars puts the sat nav in your vision without risking your expensive smartphone. When you spend serious money on a bike you need to know that it’s safe. With BikeSpike you will. This great device syncs with your smartphone and tells you if someone’s walking off with your wheels. It’s also got a great safety feature in that it will send notifications to your friends if you’re involved in a crash. If you get this device, the next time a car cuts you up you’ll be able to make some noise about it. The Orp Smarthorn combines lights and noise to notify those around you that you’re about. Ideal when a car gets too close or a pedestrian walks out in front of you. Go to orpland.com to have a closer look at this one. Most of the accidents that UK cyclists suffer on the roads happen when the rider gets into a car’s blind spot. 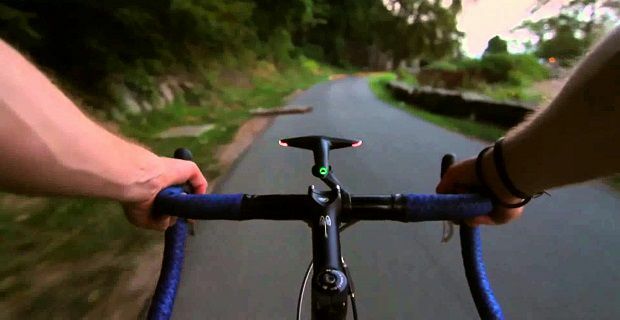 With Blaze Bike Light that won’t happen because this device projects a symbol 5 metres ahead of the rider to give a visual representation of the bike and rider to drivers nearby. This is an ingenious helmet that offers all the protection you need while you’re on the road but folds up when you’re off the bike. This is ideal for those who commute to work and have to storage space when they hit the office. Head to overade.com for more info.